This is for several challenges on Splitcoast. First the Inspiration Challenge (IC377), and I was inspired by this Fish Pin. For the Mixability Challenge (MIX4), we are to use water based mediums and I used water based reinkers and shaving cream on top of water to create my background. And last but not least, the LOVEFEST2013H challenge by Unity, colors and a picture. I used the colors as my starting point. 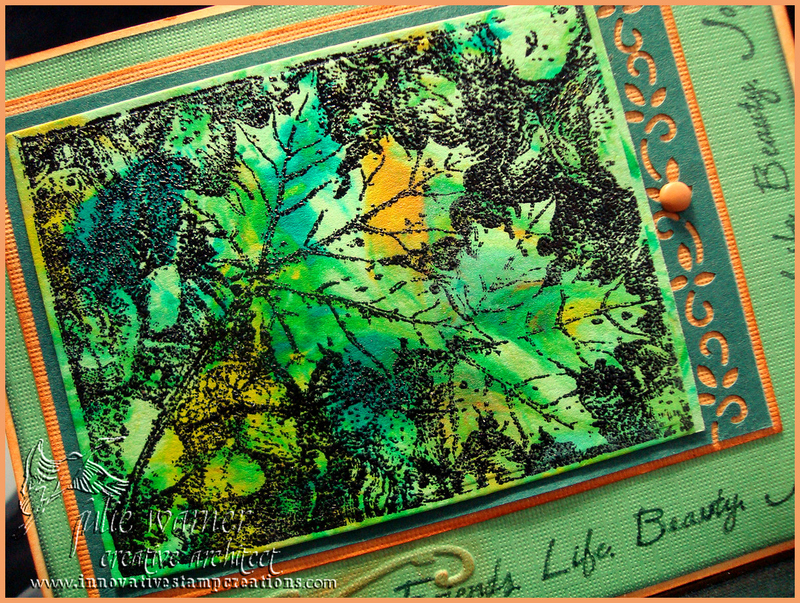 For my card, I used a shaving cream background, stamped the image on top. This technique has been around a while and here’s a link if you’d like the directions: Shaving Cream Technique. To make sure the image was dark enough, I also used black embossing powder and heat embossed it. I left a narrow border around the image when I trimmed it and then attached it to dk green layer w/ a punched side and then a gold textured layer. A little sponging was added to the gold layer, the large lt green textured layer and also the 5.5 x 4.25 ivory card. 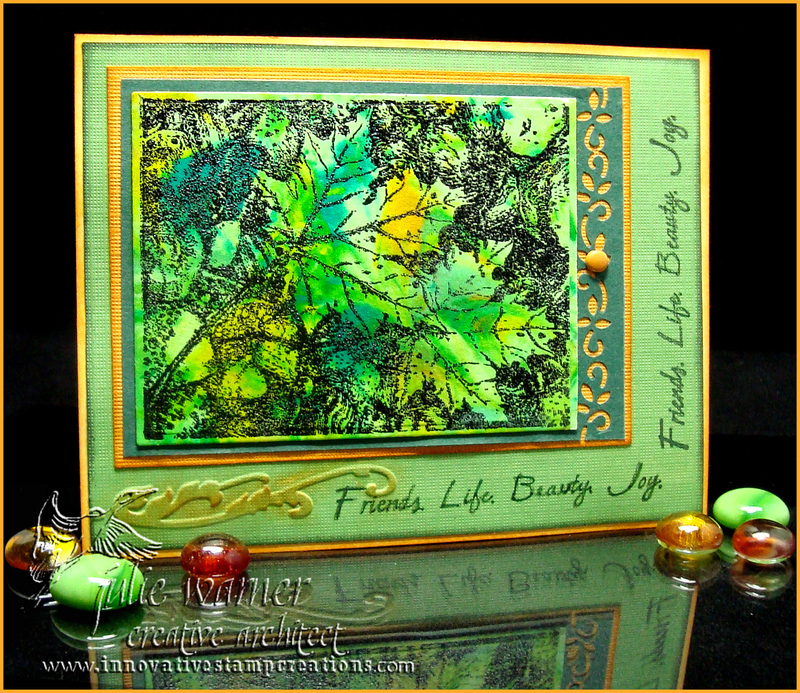 The sentiment was stamped in two directions on the lt green layer and I sponged over the top of some added embossing on the left side. For today’s Free for All Challenge (F4A157), we are to make a silly or fun card for a man. I’ve always thought this quote was a fun and I know it will be perfect for my brother in law. The guy loves a good beer and probably even some not so good ones. And since his birthday’s coming up I’m pretty sure a big mug of beer will get his attention. The images are from DRS Designs. My clean and simple card was done on half of a note card. I liked the texture of the paper so I stamped the beer mug, drew a diamond shape around it and filled in w/ a black sharpie and added doodles. I saw this technique on the latest Technique Junkie newsletter, so I gave it try. 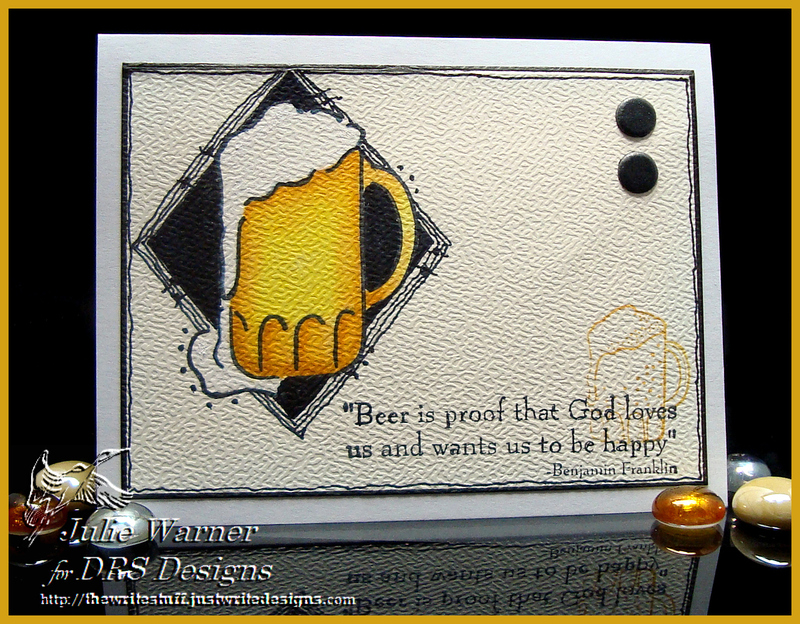 I added the sentiment and little beer mug and a couple of Candi buttons, then doodles around the edges before attaching to my 5.50 x 4.25 card. 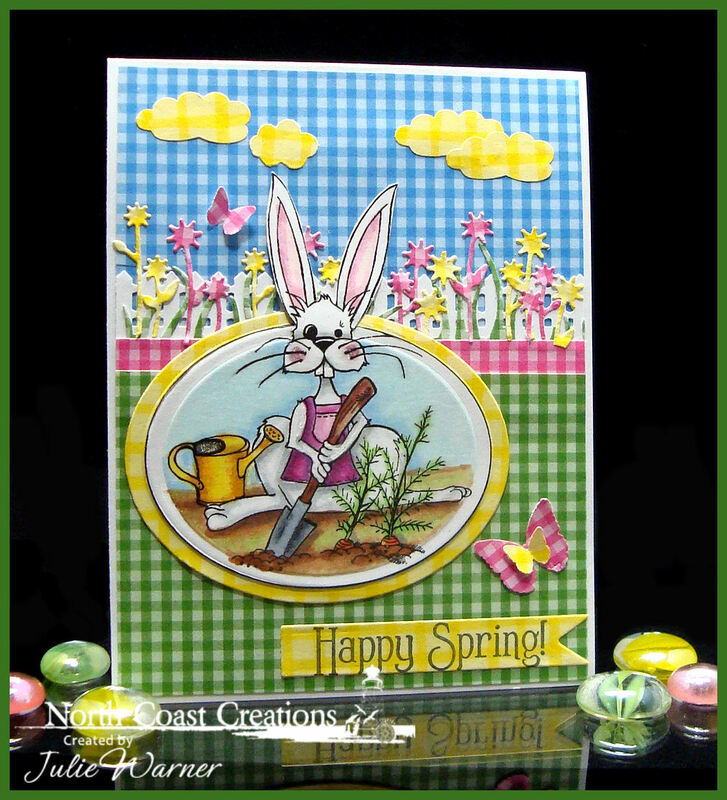 Welcome to the North Coast Creations Blog Hop! We are so pleased to announce the official grand opening of our new website! Our new product line focuses on cute, vintage and whimsical stamps, created by our team of artists and graphic designers. This is a way for us to express our creative and artistic abilities in a new and fun way!! You can sign up for our emails on our website, HERE. 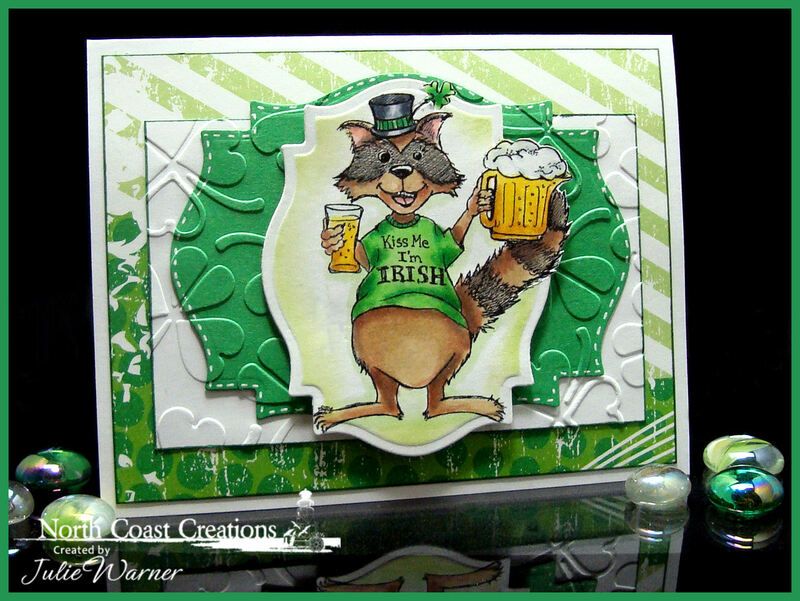 This first card was die cut using a Spellbinders classic oval. I did a little Out of the Box Nestie technique on it, left it in the die and colored it with Copics. The sentiment from ODBD Daffodil Tag set, was stamped on the yellow check dp and die cut using a banner die from Spellbinders. The fence was punched from white card stock and the grass and flowers were die cut. I added a few punched clouds and butterflies to complete my 4.25 x 5.50 card. For this card, I used the same Out of the Box Nestie technique and a Labels 18 die. Rosco is colored with Copics and while the die was still in place, I sponged a little lt green ink around the edges. The green background was also cut w/ a labels 18, attached to a larger white rectangle then embossed. I used a white gel pen to add a little faux stitching. This card is 5.50 x 4.25. Thanks so much for stopping by! Enjoy the hop and all the fun images!